By now, we’ve firmly established that my favorite fruit is strawberries…red, ripe, juicy strawberries! Driscoll’s Berries recently asked me to create a fun strawberry shortcake recipe to share with you. I never met a strawberry shortcake that I didn’t like, so I was definitely up for this challenge. I knew that I wanted to do something a little bit different, but still retain the feel of traditional strawberry shortcake…it’s a classic for a reason! I pondered this for a bit, then remembered how much we enjoyed my Baked Blueberry-Lemon Doughnuts. I decided to make a strawberry version of the doughnut to serve as the base for my shortcakes. I couldn’t wait to give this a try for my Strawberry Doughnut Shortcake. With a double helping of Driscoll’s strawberries inside the baked cake-like doughnut and heaped on top, I knew I had a great recipe on my hands. While the doughnuts baked and cooled, I let the sliced strawberries hang out in some Meyer lemon juice and sugar. The key to any good shortcake is homemade whipped cream…it only takes 5 minutes to make, and it provides pillows of creamy goodness to your finished shortcakes. It’s worth the time…trust me! Step 1: Preheat oven to 375, and spray the wells of a non-stick baked doughnut pan with baking spray. To make the doughnut batter, combine the following ingredients in a large mixing bowl: 1 cup AP flour, ½ cup sugar, ¼ tsp. salt and 1 tsp. baking powder. Mix to combine and add the following wet ingredients: 1 small container strawberry Greek yogurt (I used Chobani), ¼ cup milk, 1 large egg, 1 tsp. vanilla extract, 1 tsp. lemon extract, and the zest of one Meyer lemon. Stir just until the wet ingredients are combined with the dry ingredients. Step 2: Add ¾ cup diced Driscoll’s strawberries (depending on size, this is about 6-8 berries). Carefully fold the berries into the mixture and carefully spoon or pipe the dough into the wells of the doughnut pan. Bake until the doughnuts are golden-brown, approximately 20-25 minutes. Make sure turn the pan around halfway through baking time for even cooking. Let cool in pan for 3 minutes, then remove to a rack to cool to room temperature. Step 3: While the doughnuts cool, make the strawberries. Cut 1 lb. 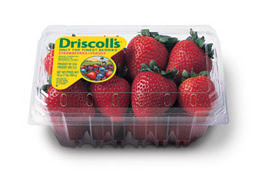 Driscoll’s strawberries into bite-sized pieces. You should end up with about 4 cups of berries. Add 2 tbs. sugar, 1 tsp. vanilla and the juice of half of a Meyer lemon. Stir to combine and refrigerate for at least an hour so the berries can release some juice to form a syrup. Step 4: Just before serving, make the whipped cream. Place 8 ounces of chilled whipping cream in a bowl, along with 1 tsp. vanilla and 2-3 tbs. powdered sugar. Whip with a mixer on high speed until stiff peaks form, about 3-4 minutes. To assemble the berries, add a bit of whipped cream to the center of each strawberry doughnut. Top with some of the berries, drizzle with some of the reserved syrup, and top with more of the whipped cream. This spin on classic strawberry shortcake is fabulous…the doughnuts are cake-like, which works well for shortcake. They pack a nice punch of flavor from the lemon zest and strawberries. The whipped cream has just the right amount of sweetness, and the berries have a nice sweet-tart punch from the Meyer lemon juice. Each bite is the perfect balance of whipped cream, strawberries and cake. We loved this...it made a perfect Summer dessert! Feel free to sub in your favorite berry if you prefer…blueberries and raspberries would work particularly well with the lemon background flavor in this dish. Disclosure: Driscoll's provided me with free product coupons to facilitate this post. All opinions expressed are solely mine.